The picture on the left is an amalgamation of some newspaper titles 30 years ago. It demonstrates how the people of Iran were lied to at the beginning of the revolution. Starting from top right hand corner, the titles are numbered 1 to 9. 1 - Water and Electricity will become free. 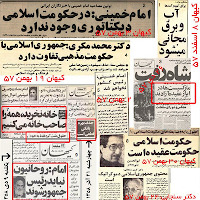 2- Imam Khomeini "In an Islamic state, there is no dictatorship"
5- Imam Khomeini "I will not become the top chief in the country"
8- The hapless leader of Iran's secular National Front, Karim Sanjabi "The essence of the Islamic Republic is democratic"
9- Imam Khomeini "The clerics must not become president"
L’image sur la gauche est une compilation de quelques titres de journaux datant d’il y a 30 ans. Elle démontre comment on a menti au peuple au début de la révolution. you didn't see the post related to the rights of Kurds? Green movment run by same criminal gangster regime ? No thanks I rather do ten years in prison than trust those liers and killers. Potkin-e-aziz, there has been a secularizing trend over the past 30 years. The clergy are becoming less and less prominent, while the military are on the ascendancy. 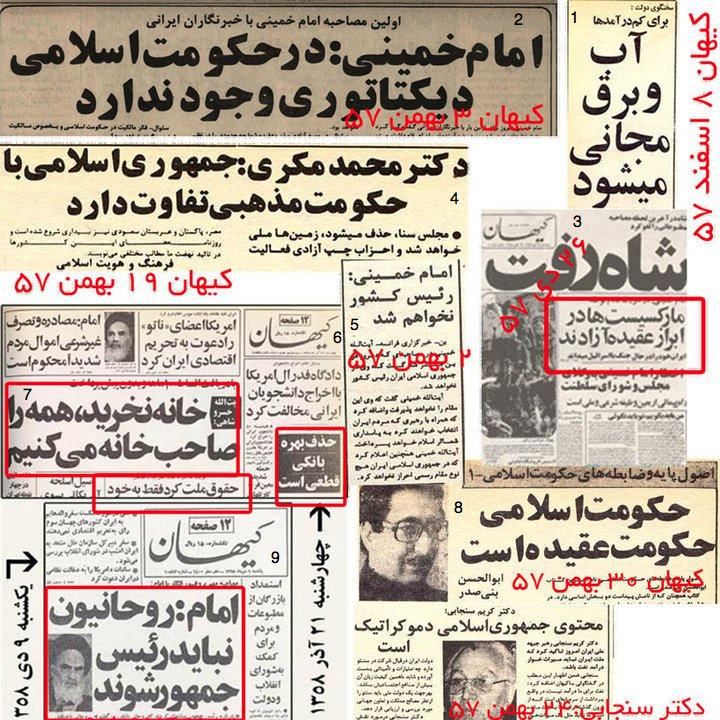 In 1980, 50% of the deputies in the Majlis were mullahs. Now it is only 10%. One of the reasons Ahmadinejad was elected in 2005 was because he is not a mullah. Indeed, his government is quite anti-clerical seeing the mullahs, epitomised by the likes of Rafsanjani and Karroubi, as corrupt and having betrayed the ideals of the Revolution. Why you support Mehdi Karroubi is beyond me. He is a fat, corrupt mafia mullah and a repeated liar.